A beloved Atlanta-area pediatrics practice is expanding to provide better care for all children. Dr. Raymond J. Deeb has had the opportunity to expand his Briarcliff Pediatrics practice by welcoming a second board certified pediatrician, Dr. Ashley N. Brown. A native of Luverne, Alabama, Dr. Ashley N. Brown graduated from the University of Alabama School of Medicine in 2012 and completed her Pediatrics residency at UAB and Children’s of Alabama, the third largest children’s hospital in the nation. Two years of subspecialty training in Pediatric Critical Care Medicine (PICU) at Children’s of Alabama has given her extensive experience treating critically ill children, both in Alabama and across the entire Southeast. Dr. Brown is board certified by the American Academy of Pediatrics and has already established long-lasting relationships with patients that she looks forward to building for many years to come. Finally, Briarcliff Pediatrics is excited to announce their completely redesigned website, which features a regular blog covering the latest topics in children’s health care. As long-time advocates of patient education, both Dr. Deeb and Dr. Brown believe that when parents are well-informed about the science behind children’s health, they make better decisions that lead to better long-term outcomes. 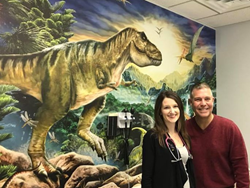 You can read more about Briarcliff Pediatrics, read the regularly updated blog, and even see some pictures of the amazing new murals and happy patients, at briarcliffpediatrics.com. Founded in 2001 by board certified pediatrician Dr. Raymond J. Deeb, Briarcliff Pediatrics is a full service children’s health care practice that provides preventive care medicine, well-child checkups, immediate care appointments, and referrals to sub-specialists for newborns and children up to the age of 18. The entire Briarcliff Pediatrics staff is dedicated to providing excellent medical care to all children in a setting that is both professional and comfortable for our patients and their loved ones. Briarcliff Pediatrics is currently accepting new patients and offers same day appointments. You can contact Briarcliff Pediatrics at (770) 939-7676 or at briarcliffpediatrics.com.